Do you know a child who struggles with anxiety? Can't focus in class? Has "behavioral" issues? Ahoy! Are your little pirates causing a mutiny in the kitchen or the classroom? 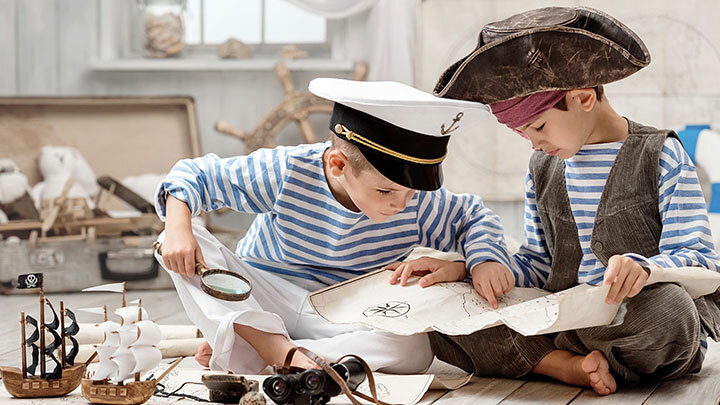 This pirate themed course will give you breathing techniques, Yoga postures, mudras (hand gestures) and relaxation strategies you need to help kids find their own hidden treasure - stability and calm from within. Most importantly, you will learn the deeper wisdom of the human mind and the root cause of behavior. It's a new perspective from an ancient tradition. Specific cues to use for kids in Yoga poses so you can share the practice with confidence and ease. Basic practices you can use again and again at home or in class. The key poses that help children develop stability – the foundation of well being. The exact words to use to help kids relax. Specific actions for Yoga teachers, school teachers and parents. Uncover & resolve the root cause of inattention and anxiety in children. Workshop Discussion Video. Mira walks you through practical, actionable strategies from the yoga tradition, explained in simple terms that you can relate to. You can watch the video right on the website AND the files will be available for you to download. Practice Video. Watch Mira teaching the Pirates on a Treasure Hunt yoga lesson plan to one of her teenage students. It will help you have realistic expectations about how children practice yoga. You and your children can practice right along. Director’s Cut. Mira shares the “dos” and “don’ts”, explains why and how each element is beneficial, when to use it and how to practice safely. Lesson Plan. You will be able to download the Pirates on a Treasure Hunt lesson with all the elements included. Coupled with the video, it will be all you need to replicate the practice – or any part of it. Multiple Formats. There are video, audio and .pdf files - so you will have the information to keep forever in whatever format best suits your style. You can take the course completely online or download the files to watch, listen or read on the go. Discussion Area. You will be able to ask questions, make comments, and share your experiences as much as you like via the online comments area. We'll be there with answers, support and encouragement.